This Sword & Sorcery review was made after playing the game six times. What is Sword & Sorcery? 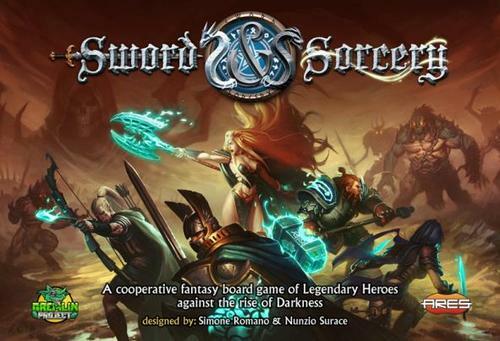 Sword & Sorcery is a cooperative dungeon crawl in which you’re controlling heroes who have been risen from the dead to take on some nasty enemies. The game was designed by Simone Romano and Nunzio Surace and it’s published by Ares Games and Gremlin Project. In each game of Sword & Sorcery you’ll be attempting to complete a quest from the Storybook. You’ll set up the map tiles, Story Events, enemies, Waypoints, doors, and other items exactly as they’re diagrammed in the book. You’ll learn what you have to do to complete each quest as you move through the quest. When you first start the campaign or when you play a one-off quest, you’ll choose which hero you want to be and their Soul Nature. The three Soul Natures are Law, Neutral, and Chaos, which alter the heroes’ play styles. This is an important part of setup because you can’t have Law and Chaos heroes in the same party (Neutral can be with either of the other two) and the Soul Natures let you know which cards you can and can’t use. The heroes have their own attributes, innate powers, and power cards. They are further customized by the weapons, armor, and artifacts that they get during the quests. Each hero has a Soul Gem, which tells you how much health they have, the number of power and talent cards they can have, the number of combat activities they can take, and the number of action activities they can take. As you move forward through the campaign, you’ll be able to gain Soul Ranks and increase these attributes; thematically, you’re gaining back your old abilities as you kill more evil enemies. During each round of the game, there will be a Time Phase, a Battle Phase, and an Event Phase. The Time Phase is basically when everything refreshes and the power cards you used either get refreshed or get one step closer to being refreshed. The Battle Phase is when the heroes and the enemies move and attack. The Event Phase is when you draw and resolve an event card, which could be a positive or negative effect on the heroes, the enemies, or everyone on the map. During the Battle Phase, the heroes can decide to activate in any order they choose. They can move around the map, open doors, interact with different items, and fight enemies. Whenever a hero defeats an enemy, that enemy will drop some type of reward. 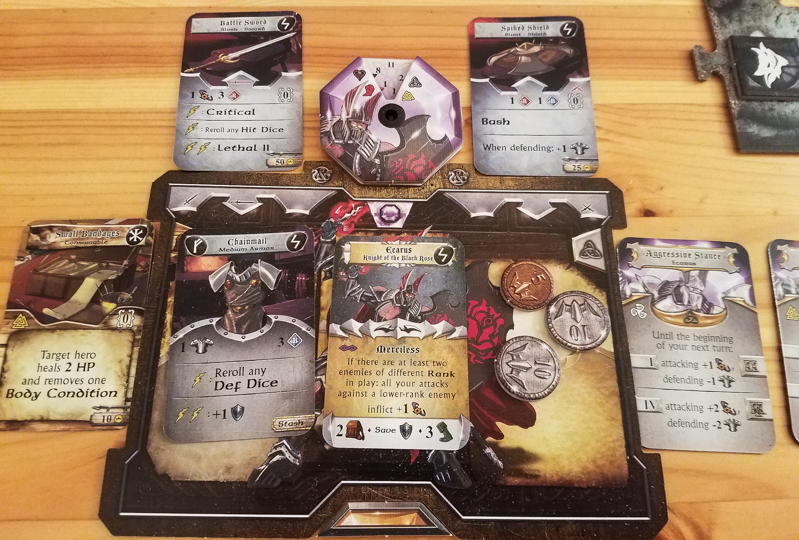 If a hero ever moves within line of sight of an area where there are shadow tokens (hidden enemies), those enemies are revealed, a card is drawn to see what type of enemies they are, and their matching miniatures are placed on the map. After each Hero Turn, an Encounter Card is drawn to see which, if any, enemies activate. Each of the enemies acts and reacts in different ways. They have preferred targets and they will perform different attack actions based on how far they are from their targets. During combat, heroes and enemies attack and defend with D10 dice. These dice have icons for hits, misses, blocks, and special effects on them. When in battle with a hero, you’ll roll a number of red and blue dice based on the weapon they’re using and then check to see what type of defenses the enemies have. When an enemy attacks, you’ll check their attack skills and any extra abilities they have to see how many dice they roll and then use your armor and/or shields to attempt to block. If a hero is ever taken to zero health, they lose a Soul Rank (this hurts!) and they can only move and use their Soul Shout ability on their turns. However, there are shrines on the map where these heroes can be resurrected if the group has enough Soul Points to spend. As you move around the map, you’ll be stopping at different Waypoints and Story Events. When you reach these spots, the Storybook will tell you where to read in the Book of Secrets. This moves the story forward by giving you more information about the quest and possibly spawning even more enemies to deal with. The Book of Secrets will also let you know when you’ve completed a quest. When you complete a quest, you can keep all of your current items and move on to the next part of the campaign. Your coins can then be spent at the Emporium, which has items you can buy as well as some helpful consumables you can use. And those are the basic rules of Sword & Sorcery. There is a lot more to it than that, but hopefully you now have a feel for how the main phases of the game work. The story is well-written and well-implemented. When you reach Waypoints and Story Events, the bits of story found in the Book of Secrets does a good job of letting you know where you are in the quest and sometimes even has some cool choose-your-own-adventure elements. Every character feels very different than the others. The powers, talents, weapons, shields, and everything else you can attach to your hero ensures that you will have a different approach to the quests than everyone else. This is one of the nicest-looking dungeon crawls I’ve played. The map tiles, the miniatures, the custom dice, and most of the other components look great on the table. There’s a lot more replay value here than I expected. You can play each scenario as a one-off quest and there are ways you can easily increase or decrease the difficulty level. The shadow tokens are also randomized at the start of each scenario, so you’re never sure what’s around the corner. Even just switching characters makes for a very different experience. Setup doesn’t take too long at all. 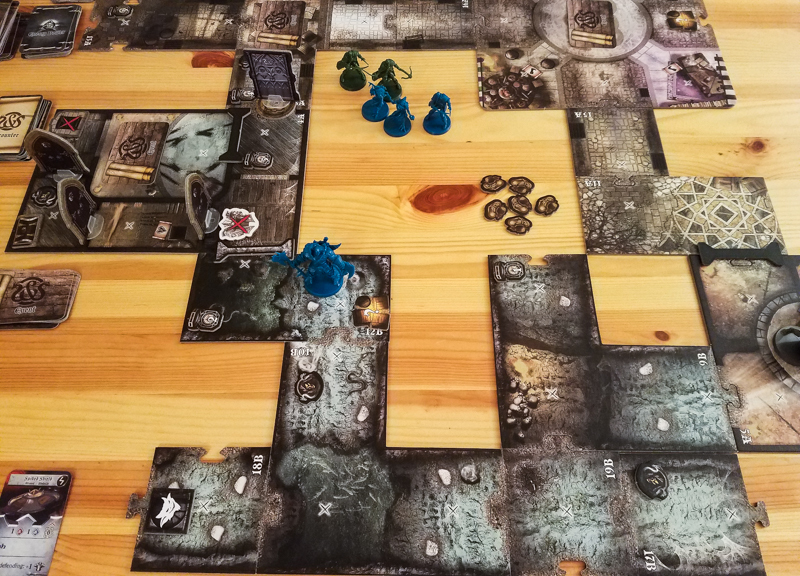 The map tiles are clearly numbered so, unlike other dungeon crawls, you can very easily grab the ones you need and put the map together. I only needed about 10 minutes to set up each quest. There isn’t always a smooth flow to this game. 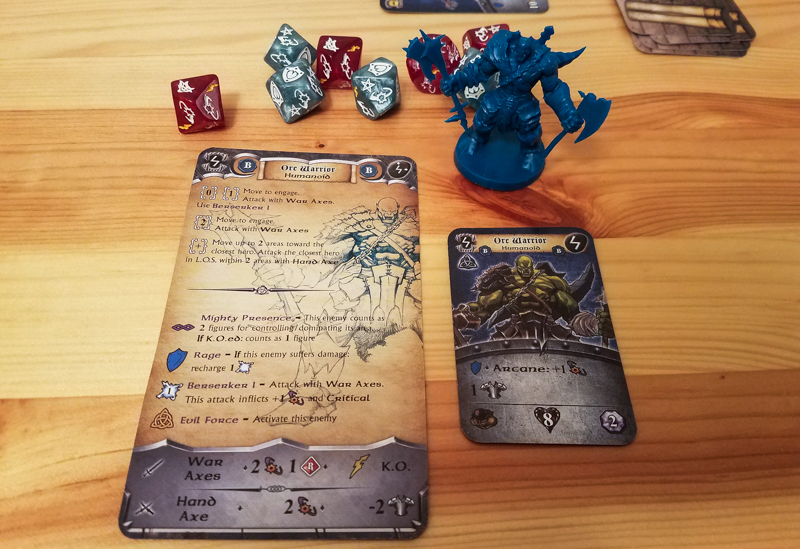 Some rounds do go pretty smoothly – you move your heroes, attack the enemies and they attack back – but during many rounds you’ll have to check the rule book and/or the reference sheet multiple times, especially during your first five or six games. There are so many different types of character and ability interactions in this game that it’s almost impossible to remember them all, and that can definitely slow the game down. Because there are a lot of different abilities and stats to keep track of, it’s very easy to forget to calculate some of them in during battles. For example, you could have three successful attacks on your dice, two from your weapon, and one from a power that you have activated, and the enemy might have two defense from abilities, one defense because you’re using a specific weapon, and a reaction ability to being hit by an attack…. Oh, and the event for this round also decreases your attack by one. Forget one of those things and you could totally change the outcome of that battle; it’s VERY frustrating when that happens. The rule book is just okay. All of the rules are there, but it can take a few minutes to find the exact rule you’re looking for. If you’re the rule book reader in your group, plan on reading this one two or maybe even three times before you teach it to your group. I do wish that the character sheets were a wee-bit thicker. They slide around pretty easily, which makes the cards on or around them slide around too. 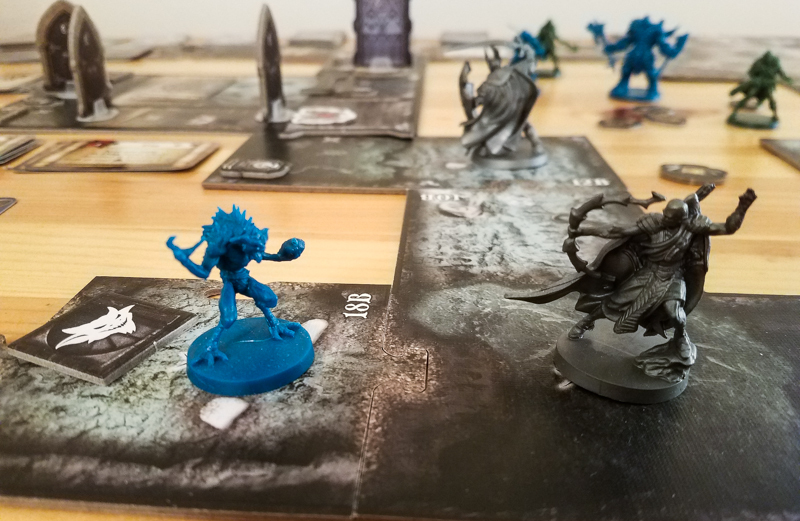 Sword & Sorcery brings something new to the dungeon crawl category, but it wasn’t a hit with me or my group. I love the way you can build unique characters, I love the way the game looks, and the story it tells is pretty great, but this game is definitely not for me. We played three sessions of two games apiece, and I got a headache during two of those sessions. It was just way too much looking at this character’s abilities, then that character’s abilities, then going to the rule book to make sure we knew how those things interacted. It definitely got better as we got through more quests, but it still wasn’t a smooth experience during the sixth game. We got through six games because we did like the story it was telling and all of the new monsters that were popping up, but I don’t think we’ll be getting this one back to the table anytime soon. Now, with all of that being said, I can totally see why so many people love this game. Some will not mind learning as they go and memorizing all of those interactions, and I’m sure this game is going to be much easier for people to learn if they have a ton of experience with more complex dungeon crawls. While Sword & Sorcery is not a game for me and my group, I can definitely see it being a hit with others. If you like dungeon crawls and/or fantasy themes, I do recommend at least testing this one out to see if it’s for you. Thanks for taking the time to read our Sword & Sorcery review! To stay updated on all things cooperative board games, follow us on Twitter, Facebook, or via RSS. Could you please tell how much of exploration and other stuff besides fights this game has? I love my co-ops to be something around 50/50 (or even less fights), like “Legends of Andor”, “Eldritch Horror” or “Dead of Winter”. Will “Sword and Sorcery” be right up my ally? I incline to think that answer is “no” but want to be sure to not miss russian localization crowdfunding campaign. btw: very cool blog! I read you all the time!